 Palacios Group is clearly international, working throughout 5 continents. Its products are exported to major European countries: Germany, Belgium, Italy, Poland, England, Ireland, Portugal, Switzerland, Sweden, Denmark, Austria, Hungary, Slovakia, Czech Republic and Malta. In North and South America, Palacios products can be found in the United States, Canada, Mexico, Colombia, Chile, Brazil, Dominican Republic and Puerto Rico. In Africa they are present in Morocco, Libya, Equatorial Guinea and Angola. In the Middle East: United Arab Emirates. Plus Philippines and China.